Before we get to today’s workout I want to thank you for the amazing support you all gave me in response to my post Open Letter to the Commenter Who Said “Having a Baby Ruined My Body”. Your support (as always) has been tremendous. Today, I have a brand new, Quick Mommy and Me Workout video with my son, Maverick. This is the quick exercise routine that I do with him on days when getting in a more formal workout just isn’t working. I also included a 15-Minute Cardio HIIT for those of you looking for something with a higher burn today! In the photos below you can see the burn after one round, and after two rounds. 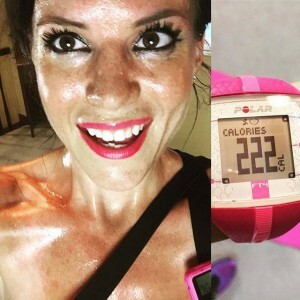 I also posted a link at the bottom of the page to the BodyRock Mom Live workout I did yesterday. So that’s three workout options for today! Burn after 1 Round of today’s workout. There is also some after-burn. I didn’t stop my watch immediately after finishing the round. My workout outfit in my cardio HIIT video is from Affitnity. They have a lot of fun fashions, and you can get 15% off with the code BenderFitness at checkout. I hope you enjoy today’s workout! I am filming a new workout today. We are having beautiful weather today so I want to take Maverick on a walk or run. I will also be posting a daily Lower Body Move Each Day this month. It’s a Booty Toning Challenge, so you can add the move to your workout of the day. I am working on getting that posted next. See you soon! Repeat 1-5X throughout the day. –Buy a Gymboss now.! Set your timer for 15 Rounds of 10/50. I’m excited for the booty toning challenge ! Loved this cardio video. Twice through now to cool downThanks! OMG, I have been hoping you would do a workout using Maverick for resistance! Keep them coming! Loved the workout with baby. I have looked at other sites for mom and me workouts because my little man wasn’t going along with me schedule. ;). So glad you are making some.